Thank you for the beautiful work you did on my father's memorial stone. The whole family was very gratified with the appearance of the monument. It was even nicer than we had imagined. Thank you for guiding us through this process. We will be reminded of your good work every time we visit the grave site. - Best wishes, Allen B. … have told several people how working with your company has meant so much to my husband and me. At a time of such crisis, it was so refreshing to find a compassionate company willing to give us a lifetime of memories in one single stone. You and your staff took the time to speak with me over the phone and find out our favorite memories and then succeeded in compiling them into one long lived memorial. The art work and finish of the granite is top quality! "Getting it perfect" was your goal and we are forever grateful to you! I particularly appreciated your following through with all the details. Classic Memorials, Inc., the leading cemetery monument and headstone company in the Cleveland and Northeast Ohio area. Call us today for a free consultation. 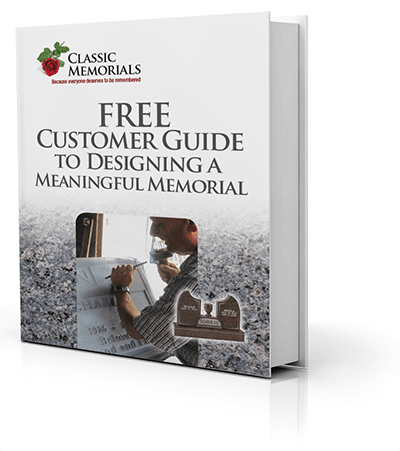 Classic Memorials Inc. © 2017 - All content including but not limited to memorial designs are protected by copyright, trademark, and other intellectual property laws. Any unauthorized use for non-Classic Memorials projects, duplication or modification of any Classic Memorials content violates such laws and will be automatically prosecuted to the full extent of the law.